Unfortunately, due to frigid temperatures, we have decided to cancel the Old Christmas celebration. Demonstrations at the Festival will include, but not be limited to, fire-starting, flax-processing, blacksmithing, cooking, spinning, black-powder presentations, and frontier games. Don’t miss this exciting opportunity! The Warriors of AniKituhwa will be performing at the Natural Tunnel State Park Amphitheater on Saturday May 20 at 7pm. This is a free family-friendly event, but the $4 per car parking fee will still apply. Volunteers from the Daniel Boone Wilderness Trail Association will be at the Carter Cabin on Friday and Saturday nights from now through December 23rd for the 17th Annual Christmas Lighting of the Tunnel Program. 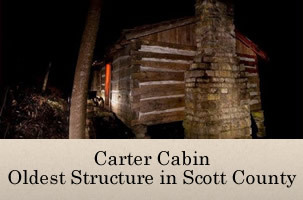 We will be at the Carter Cabin from 6-10pm talking about life on the frontier in the late 18th Century, and of course about the cabin itself. Come by and enjoy this festive event in beautiful Natural Tunnel State Park. Don’t forget to stop by the Wilderness Road Blockhouse this Saturday from 1-5 to check out all the demonstrations of various frontier skills that we’ll be offering. This is a free program and all ages are welcome to attend.